Great Sand Dunes National Park was the last stop on my quick national park extravaganza, and it was a great stop to make. I had discovered it in my handy road atlas (which everyone should own, even if they have a fancy little GPS) and thought it sounded like a good time. Little did I know how much fun I would have. - A thin layer of snow usually means the sand beneath is frozen/icy. 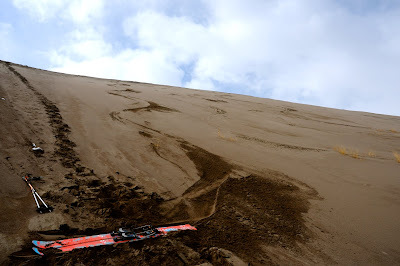 - Dry sand is skiable, but a pitch of at least 30-35 degrees. - Wet sand, but not frozen, can be a grand ol' time. 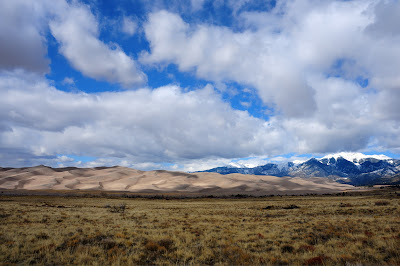 The sand dunes are located at the foot of the Sangre de Cristo Mountains, which provide a pretty remarkable contrast. In case you were wondering where all the sand came from; it mostly got blown across the Colorado plains from the San Juan Mountains. 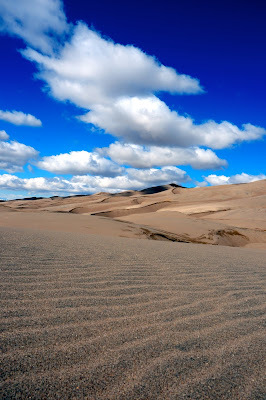 Skiing Great Sand Dunes National Park from Bernard Rocca on Vimeo. yesss! great video. you and jb should probably start up a tgr-style rival production company. serious. Really great video Bnard! Have fun pulling grains of sand out of your ski boots for the next few years. bnard- comment worthy stuff here. your videos and pics are awesome. Very nicely done - the video and the sand skiing. Too bad you're so out of shape! HAPPY 26th BIRTHDAY, MOUNTAIN MAN! Glad you all liked the video, hopefully I'll be able to make some more. But first I gotta go back to the Dunes to get my camera. Thanks for the reminder Josh!